Philadelphia guard and rookie standout Michael Carter-Williams sat out the 76ers’ game Saturday night against Denver, and will spend a third straight night in University of Pennsylvania Hospital as a result of a skin infection on his knee. This is the second straight game the rookie missed after staying behind when the team took its road trip to Charlotte on Friday. 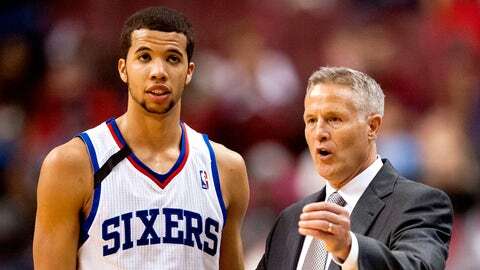 Carter-Williams was admitted to the hospital to stay on the safe side, according to coach Brett Brown. "It’s being monitored closely, but nothing to get too overly concerned with," Brown said prior to Saturday night’s game against the Nuggets. This is a big blow to the Sixers’ offensive and defensive attack as Carter-Williams is averaging 17.7 points and 7.3 assists and leads the NBA with 3.1 steals per game. He was honored Tuesday as the NBA Eastern Conference Rookie of the Month. His last game played was on Tuesday when he recorded his first career triple-double (27 points, 12 rebounds, 10 assists) in 47 minutes during the Sixers’ double-overtime victory over the Orlando Magic. Carter-Williams was walking with a slight limp during the game, and he admitted he was experiencing a lot of pain in his knee afterwards. At first it was believed that the knee soreness resulted from Carter-Williams’ bumping knees with another player in Sunday’s loss in Detroit. It turned out that the infection was causing the soreness, according to the Sixers’ announcement on Saturday. "It’s just one of those things," Brown said. "When you looked at it during (Tuesday’s overtime game), you realized there was something going on a little more than a sore knee. But at this stage he’s in good hands and how long (Carter-Williams will remain in the hospital), I don’t know." The Sixers say Carter-Williams remains listed as day to day. It does, however, seem like a long shot that he will be ready to play on Monday against the L.A. Clippers. Tony Wroten made his second straight start in place of Carter-Williams on Saturday night, dropping 20 points, but that didn’t stop the Sixers from losing their second straight in his absence.